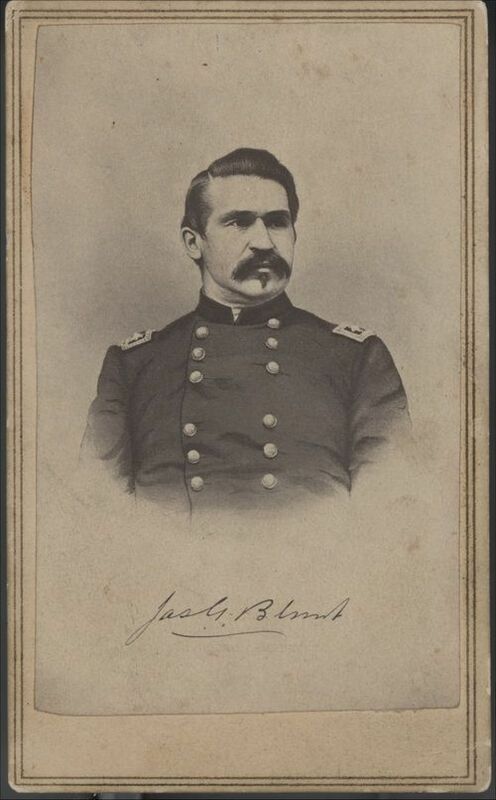 This sepia colored carte-de-visite shows James Gillpatrick Blunt in a military uniform, (1826-1881). Blunt a commander of Union forces during the Civil War served as a lieutenant colonel of the 2nd Kansas Volunteer regiment under General James Lane. He rose through the ranks when President Abraham Lincoln appointed Blunt, in April of 1862, as brigadier general of the Department and Army of Kansas. His effective leadership skills combined with military strategies, brought victory in a series of battles and skirmishes from Missouri to Arkansas. The success from these campaigns promoted Blunt, in March of 1863, to major general which was the highest military rank received by a Kansan in the Union army.